As part of the Decade of Commemorations (1913-23) Galway County Libraries has created this blog dedicated to recounting the social, cultural and political life of the ordinary men and women of Galway city and county during the course of the year 1916. Through extensive research of the local Galway newspapers from the early 1900s, this blog will gather and publish articles and letters throughout 2016 as they would have appeared in the papers, 100 years ago. We hope to give an insight into the lives of the people of Galway at the time, their day-to-day experiences, challenges and aspirations, as well as reflect on the people’s feelings towards the various contemporary national political and social questions, and their reactions to the Easter Rising, in its immediate aftermath. Galway Rising – What the Papers Said will remain as a permanent resource that can be accessed by future generations and as a comprehensive insight into life in Galway in 1916. 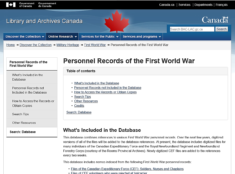 To mark the centennial of the end of the First World War and the heroic and tragic events that led up to it Library and Archives Canada has launched an online First World War Database with more than 620,000 military personnel records from the Great War….many were Irish descendants.